Selecting the perfect bridesmaid dress can be more difficult than picking the best bridesmaids. There are so many options and so many people a bride wants to please. Of course, ultimately, the only person she really has to please is herself, but it’s still nice to select a dress that makes one’s best gal pals happy and looks amazing. If you’re looking for the cream of the crop bridesmaids dress trends this season, read on. Here are the top five that are owning the aisle — and the dance floor! 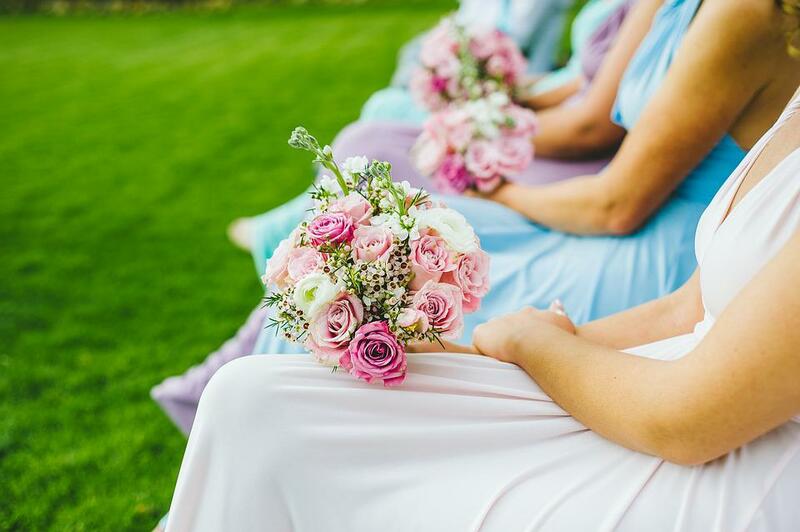 Whether it’s pastels, neutrals or rich jewel tones, selecting different coloured dresses from the same palate is a big trend right now — and it’s super popular with bridesmaids since it allows them to select colours that really compliment their skin tone. Usually, the dress style is the same, but the dress colour is simply different. This brings a fresh, interesting twist to traditional dress picks. The bride may be the only one that should wear white, but she does not have the market cornered on lace. Here’s the thing about this delicate and stunning material: it’s timeless. It’s hard to go wrong in a lace dress — or even partially lace dress — so you won’t be looking back on your wedding picks in years to come wondering what the heck you were thinking. For a non-bridal looking lace dress, select a dress that falls just above the knee or at a midi length, which is between the knee and ankle. This will help set the bridesmaids definitely apart from the bride in terms of wow factor. A lace is very elegant and can be a show-stealer, so if you shorten the length, it makes it more of a dress than a gown, leaving room for the bride to shine. This isn’t exactly a new trend, but it’s still in. Bridesmaid dresses that are in the same colour and are along the same style vein but feature subtly different details are a brilliant pick. Usually, the dresses have the same skirt, but showcase different top variations: one could be off-the-shoulder, one halter, one cap-sleeved, one strappy. 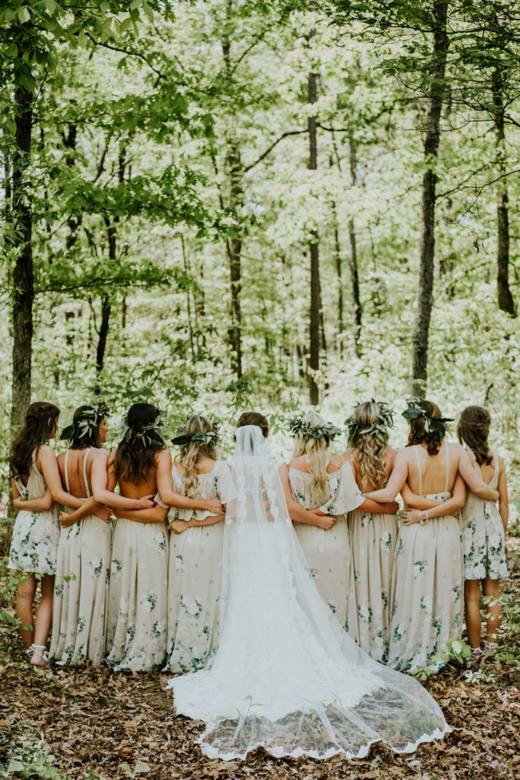 This allows bridesmaids to show a little personal sense of style while also allowing them to feel comfortable and confident in what they’re wearing. That strapless look may be good for a smaller busted gal, but anyone over a B cup generally doesn’t love the lack of support afforded by strapless dresses. Who said bridesmaid dresses have to be a solid colour? Liven it up with some gorgeous florals or whimsical waves. The bride’s dress should definitely be the talk of the town, but there’s nothing wrong with some chatter about how gorgeous the bride’s best girls looked, too. Whether it’s some sequins or beading or tired ruffles, a little embellishment can go a long way to really beautiful your bridesmaid dresses. These details will speak to the bride’s personality as well as the theme of the wedding: ruffles are playful and elegant. Beading is super beautiful and sophisticated. Sequins are exuberant and sleek. The detail you select will depend on what message the bride wants to convey. Bridesmaids are a reflection of the bride, so it makes sense that the lady of the hour would want her dearest friends to look amazing. If you’re perusing for the perfect bridesmaid dress for this season that will really make an impression for all the right reasons, follow these trends. See where they take you!